There are many advantages to diving closed circuit for the underwater image creator such as better interaction with wildlife or longer dives. However, there are also a number of disadvantages to consider such as added complexity and task loading. In underwater imaging, one of the most important rules is to get close to the subject. The challenge therein is marine life does not always cooperate. A large noisy animal blowing bubbles tends to intimidate most marine life. A diver using a closed-circuit rebreather may still look strange, but as the device eliminates the noise and bubbles, creatures that are otherwise difficult to get close to often hardly notice the presence of the diver, or at least they react differently. Animals that may not be outright scared by a scuba diver in the first place also tend to have more natural behaviour, or will at least keep less of a distance, allowing the photographer to get much closer. 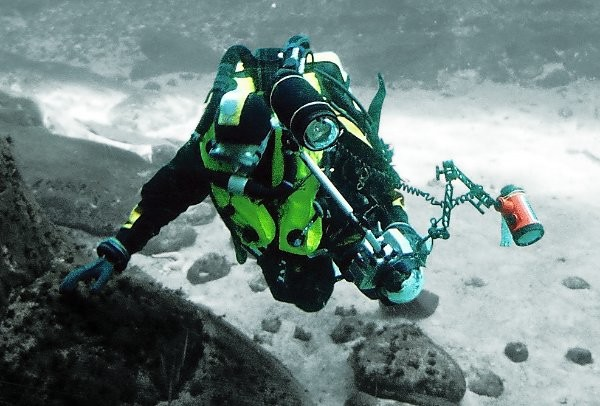 Another primary use of a rebreather is to extend the duration of dives, say, on wrecks. Many of Steve Jones’ photographic assignments are on wrecks that lie relatively deep, and he needs time to work at depth in order to set-up off-camera lighting and get the key shots. Sometimes he will only have one chance at a subject due to tides or the trip schedule, so the rebreather allows him to make the most out of each opportunity. Having a practically unlimited gas supply is a real advantage. Decompression times are shorter with a rebreather than on open circuit for most dive profiles. More bottom time and less decompression time means more shooting time. The time in the water is more comfortable when diving closed circuit. The breathing gas is moist and warm, so the diver will be warmer in cold water. This allows the underwater image producer to experiment more and concentrate on the image with less time restrictions. Gas logistics for deeper dives on wrecks are much more manageable on a rebreather; another benefit is being able to switch to the optimum gas for each dive in a cost-effective manner. Given the task loading of operating a camera and rebreather, Steve uses a trimix diluent when deeper than 35m. Swapping a 3-litre diluent tank from air to trimix is straightforward, whereas getting a twinset filled with trimix may not be, when in more remote locations (and it’s never cheap). Of course, all that has to be weighed against the large costs associated with the rebreather—gas cost savings alone will never justify the investment of buying a unit, as the overall cost of ownership is much more expensive than open circuit for most divers. Diving on a rebreather can simply be enjoyable, changes the way you dive, and the benefits are simply huge. But as with all things, the rebreather is a tool and there are multiple occasions when open circuit is a better choice—particularly if diving in strong currents, or hard swims are involved to get in position. Darwin and Wolf Islands in Galapagos are prime examples where a rebreather would be more of a hindrance than a benefit as these are high-energy dives. There are also cases where the lack of bubbles can actual be a disadvantage in the encounter with wildlife. For example, the Revillagigedo Islands on the west coast of Mexico are known for diver-friendly giant manta rays. Not only do these gentle giants allow open circuit divers to get close, they appear to actually enjoy the bubbles. It is not unusual for mantas to swim over and stay above divers, allowing the bubbles to massage their undersides. A disadvantage is the extra set-up time—one can never “just jump in.” The preparation time in regards to the rebreather is on top of camera set-up, so a great portion of assignments is spent getting gear ready. Of course, keeping the loop clean and hygienic also adds further tasks, but this is particularly important in the tropics where germs fester quickly. Nobody likes a smelly breathing loop! Another issue is the huge amounts of baggage one has to carry. This limits the airlines that can be used for long haul flights, as the load of camera equipment, plus a rebreather, will take a minimum of two pieces of 32kg hold bags, plus hand luggage—all of which sums up to weights that some airlines will not allow you to carry. Last but not least, not all dive operators support rebreathers, so there are many occasions when we would love to use the rebreather but have to dive open circuit. Safety issues have to be considered. When diving closed circuit, we do not have to worry as much about the quantity of gas, but about the composition of the gas we breathe. Rebreathers are gas-mixing machines. Typically, they use two tanks. One tank will have oxygen and one will have a diluent gas, which could be air or a helium-mix depending on how deep one is planning to explore. Oxygen sensors show divers what their partial pressure of oxygen (ppO2) is. When diving on a rebreather, frequent monitoring of ppO2 is of utmost importance, and this adds to task loading, constituting an ongoing distraction for the image maker who has to juggle paying attention to their life support gear (rebreather with all its attached paraphernalia) while being creative and working with a camera set-up, which comes with its own own complexities. Using a heads-up display or a heads-up computer such as the Sheartwater Nerd is a good idea. This way, the diver can monitor essential dive information more easily while creating images. Many divers consider rebreathers to have more risk when diving shallow, but are the safer option when diving deep. Also there are enormous savings to be made on helium, as much less is needed as diluent than is required for open circuit. For these reasons, rebreathers are great tools for deep scientific diving and photo documentation of those studies. When diving inside overhead environments, it is common for bubbles to produce silt from hitting the ceiling of a cave or wreck. This could be dangerous, or at the very least, ruin conditions for creating images. Using a rebreather, on the other hand, does prevent silt caused by bubbles, but buoyancy control is critical. Unlike on open circuit, a rebreather diver cannot control or adjust buoyancy by inhaling or exhaling. On a rebreather, the exhaled gas from the lungs goes into the rebreather’s counter lungs, so the total volume of gas is always constant, and so is the buoyancy unless gas is added or vented. It is thus important to get rebreather training for the overhead environment you will be working in. You need to have experience diving that particular environment with a rebreather before carrying in a camera. Using a rebreather is more complex than diving open circuit and requires more preparation, discipline and diligence. Consequently, training and experience is needed before one also brings along camera gear on dives. Getting ready for the dive is also more time consuming, as divers need to make sure that both their camera gear and their rebreathers are ready to hit the water. Gas needs to be analyzed, scrubber must be packed correctly, and o-rings on both the camera and the rebreather have to be checked and cleaned. Pressure checks need to be performed on both imaging and life support systems. A mistake prepping camera gear could be expensive, while a mistake preparing the rebreather could also be deadly. Hence, it is critical not to rush and to work in a structured, disciplined manner, which is why rebreathers come with checklists to follow prior to each dive. At a dive resort, open-circuit divers without camera gear will be enjoying the beach or an after-dive drink, while rebreather diving photographers continue to work hard to get their gear rinsed and put back together for the next day of diving. It is better to get it done in the evening when issues can be rectified in an orderly and calm manner, rather than feeling rushed the next morning because the dive boat is about to depart. Camera gear should be tethered to divers. Using a coiled lanyard is a good idea. This way divers will always have imaging equipment connected to them in case they have to drop the camera to operate the rebreather. It is best to leave the port cover on the port until you start shooting. This will prevent scratches caused by the port banging against bailout tanks and other gear. The principles I follow are simply good tech diving practices. I streamline my kit as much as possible, ensuring all my clutter is stored in pockets. Getting my bailout tanks neatly stored is also paramount. I tend to dive with all my tanks on the left, and keep ancillary equipment such as camera, and a clipped-off scooter if carrying one, on the right; however, sidemount-style bailout configurations are also very neat and streamlined. Larry Cohen and Olga Torrey are well-traveled and published underwater photographers based in New York City, USA. They offer underwater photography courses and presentations to dive shops, clubs and events. For more information, visit: Liquidimagesuw.com (Larry) and Fitimage.nyc (Olga). Steve Jones is an underwater photographer, technical diver, journalist and expedition leader based in the United Kingdom. For more information, visit: Millionfish.com.